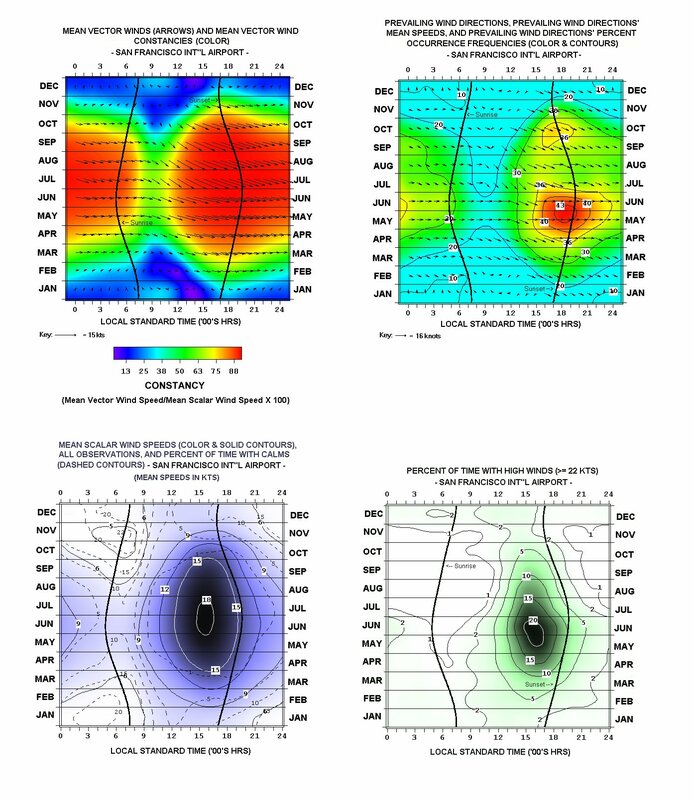 The uppermost chart for a given year’s page (accessed by the links below) are “floating-bars” of the year’s daily maxima and minima temperatures. Superimposed on the bars are two line traces, the upper one connecting 1921 to present mean daily maxima, the lower one mean daily minima. 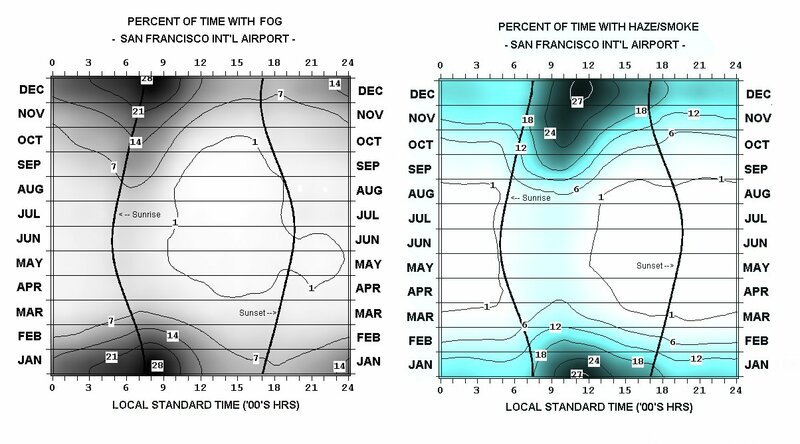 The bars depict the varying diurnal, synoptic, long-wave, seasonal, and sea-surface temperature anomaly influences on San Francisco temperature over time, and subjectively, some years’ features can be quite interesting to look at. 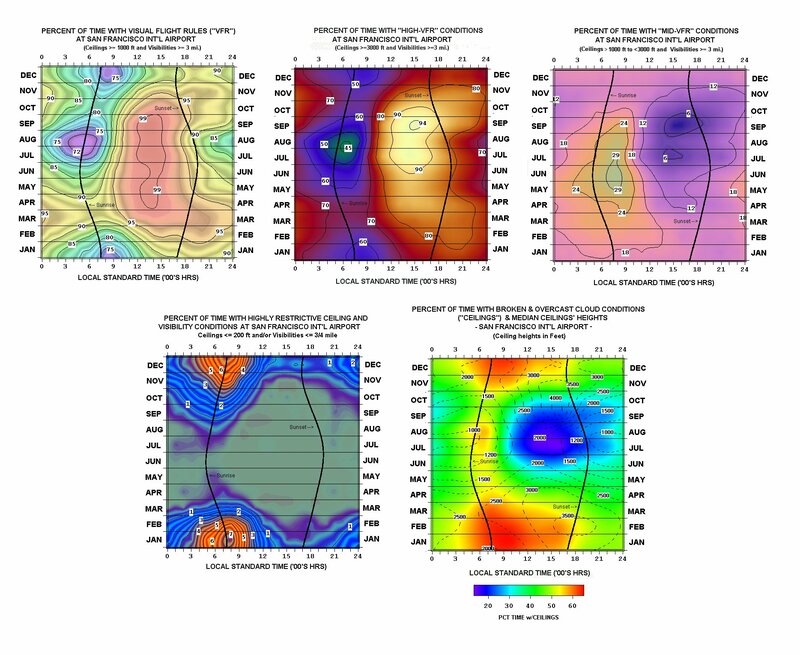 The second chart down shows the day-to-day mean temperature anomalies (daily mean temperature less the corresponding long-term climatological mean). Vertical lines extending upward from the zero line indicate above average means for the day (colored red), those extending downward indicate below average daily means (colored blue). 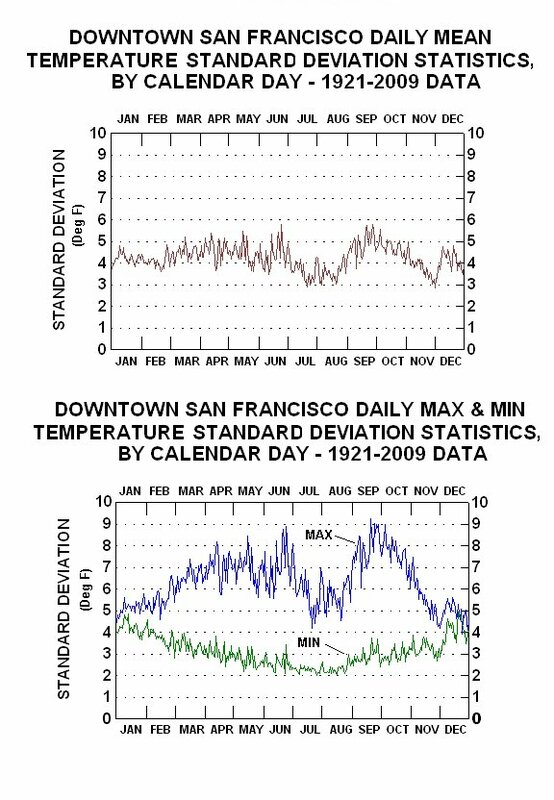 In general, the most extreme departures for Downtown San Francisco are positive, reflecting to a large extent the occurrence of warming offshore flow episodes. In the entire 1921-present series, greatest positive departure for any given calendar day is +25 F for 14 June 2000, the most negative departure -22 F for 11 December 1932. The third chart down shows the second chart’s anomalies in deseasonalized (“standardized”) form. This adjusts for the fact that individual calendar days have higher or lower inherent year-to-year variability in mean temperature. To create a common relative anomaly scale for each day, the anomalies are divided by their corresponding calendar day standard deviations to generate “standardized departures” or “z-scores”. Those scores of plus or minus 3.0 occur just 1.9% of the time; nearly all of these (96%) positively signed, reflecting extreme warming offshore flow events. Greatest positive standardized departure in the record is +5.7 for 17 July 1988, greatest negative –4.9 for 11 December 1932. The bottom chart depicts daily precipitation totals, as high as 5.54 inches (5 November 1994). 1925 – Wettest May in all history (4.02”). 1926 – As influenced by a strong El Nino, warmest March, April, and May since the start of the official history (in 1871). Also warmest year to date. 1932 – Sharp December cold snap over the 8th-14th. Coldest week long period (38.9 F) of 1921-present era. Max/min temperature only 35/27 F on 11th. Daily min (27 F) on 11th coldest such temperature recorded in Downtown San Francisco history. 1934 – Warmest year up this time (58.9 F) until tied by 1983. 1937 – Coldest January in all history. First 52 days of the year each below average in mean temperature. .
1938 – Nineteen consecutive measurable rain-days over late January buy pfizer viagra online to mid-February. 1939 – Warmest September on record up to this time. September 17th-23rd the warmest week long period (79.3 F) in all history down to present. 1940 – Lowest average day-to-day variability in maximum temperature (3.3 F) of any year in history. 1940-41 – Strong El Nino episode. Wettest July-June water year (35.05”) since 1889-90. 1941 – Lowest average daily temperature range (10.6 F) of 1921-present period. 1949 – Very cool January and February help produce coldest winter in all history (Dec. ’48 – Feb ’49). 1951– Coolest Summer (Jun.-Aug.) since 1911 and coolest Summer through the present. 1955 – Coolest year (55.2 F) since 1901 and through the present. 1957-58 – Strong El Nino. Wettest July-June water year (36.48”) since 1889-90. 1958 – Scattered four to six week much above normal temperature spells over the year. Heavy rains during late Winter/early Spring. March and April with 13.69” rain, wettest March-April since1884. Mildest December in all history. 1962 – Coolest July since 1901 and coolest September since 1910 and through the present. Second wettest October (5.51”) in history. Rainstorms interrupt 1962 World Series. 1964 – Coolest Spring (March-May) since 1911. 1967 – Irregular anomaly pattern in temperature and rainfall over course of year. Coldest April in all history, wettest June (1.42”) since 1884. 1969 – Second lowest annual maximum temperature (82 F) in history. Lowest 78 F in 1878. 1970 – Highly irregular temperature anomaly pattern over course of the year – Mix of short and long-term warm/cold spells. 1971 – In an otherwise cool year, warmest day in Downtown San Francisco history (101 F/ 72 F) on14 September. 1972 – Severe cold snap in early December. Coldest December since 1908. 1975-76 – Driest rain year (July-June) in all history (7.16”). 1976-77 – A second droughty rain year in a row. Fourth driest in history (10.02”). Two-year rain deficit about 25”. 1982-83 –Great El Nino. Water year precipitation (38.17”) most since 1889-90. 1983 – Annual mean temperature ties 1934 for warmest in history up to this time. Eight of the next fifteen years including 1983, equal to or warmer than 1934 (temperature history). Wettest March (9.04”) and warmest Summer up to this time. 1984 –Highest average day-to-day variability in maximum temperature (5.0 F) of any year in history. September warmest calendar month in all history (69.4 F). 1985 – Summer mean temperature eclipses 1983 record. 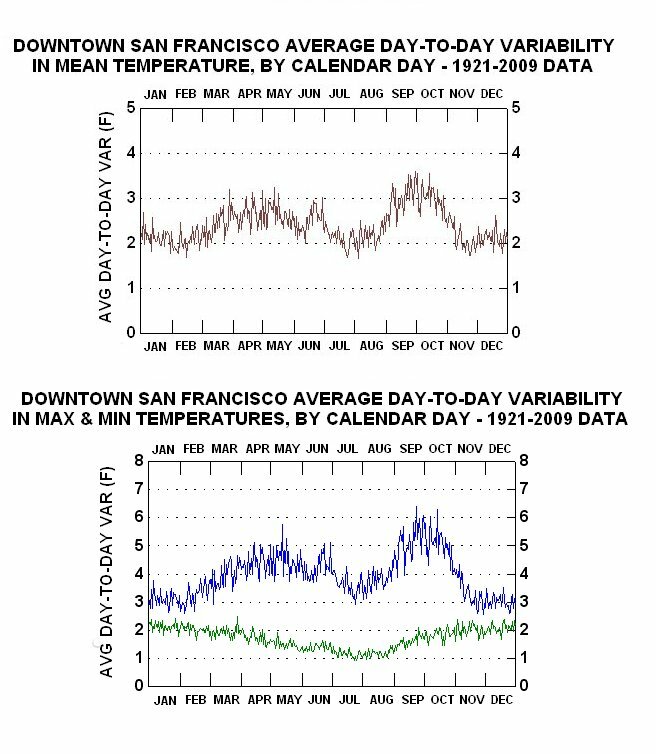 1988 – 103 F on 17 July; highest temperature ever recorded in Downtown San Francisco. 1989 – Five-day summer-like spell in early April. All days 87 F or higher. 1990 – Intense cold spell in late December, but 1990 still as warm in the mean as 1934 and 1983. Highest average daily temperature range (15.7 F) of 1921-present period. 1993 –Warmest Summer in all history. 1994 – Coldest and 2nd wettest November (11.49”) in all history. 1995 – Warmest July in all history. 1996 – Second warmest year in all history (60.3 F). 1997 – Third warmest year in all history (60.1 F). 1997-98 – The other great El Nino of the 20th century. Wettest rain year (47.22”) since 1861-62, second wettest in all history. Wettest February (14.89”) in history. 1999 – La Nina year. Coolest year since 1975 and coolest Spring since 1911. 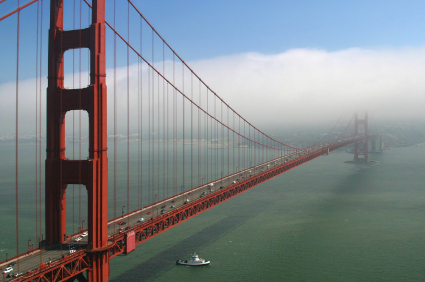 2000 – 103 F on 14 June, ties July 1988 mark for highest temperature ever recorded in Downtown San Francisco. 2003 – Scattered abbreviated much above normal temperature spells. 2004 – Another year of abbreviated much above normal temperature spells. 2005 – Annual maximum temperature (82 F) ties 1969’s mark for second lowest since 1878. 2006 – Coldest March since 1911 and 4th wettest March (8.74”) in all history . Unusual heat in July.